I like this book very much because although I could read it by myself, I read it with my mom. 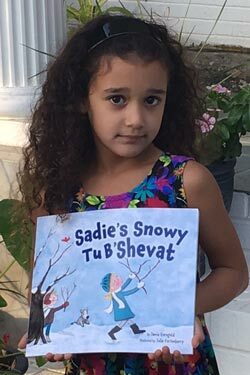 Like Sadie, I love Tu B’Shevat, and while I know that it’s winter here, in Israel for my grandfather and grandmother, it’s summer. I also like planting trees and playing in the snow with my sister and my friends, just like Sadie. I am looking forward to meeting the author, who I heard was the Adventure Rabbi, when she comes to visit on December 2!! about Latkepalooza and Camp Extravaganza, visit JewishVA.org/Latkepalooza.